In an intriguing marketing ploy by out-of-the-finals Sydney FC, a new signing will be announced during their match-up with Wellington Phoenix. Creating further speculation and excitement is that the half-time announcement will be a foreign signing. 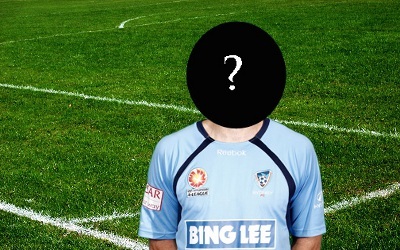 The unknown player will then send a video message to Sydney fans at the stadium via the big screen. “We don’t want to give away too much but I can say that the fans will love whose face pops up on the screen at the SFS on Wednesday night. He has flair, scores goals and plays with passion. A perfect fit for us” Sydney FC CEO Edwin Lugt said. While there will be furore over this half-time spectacle, there is also a game to be played, and Wellington will be looking to secure their finals berth early. A win or draw at the Sydney Football Stadium would be enough for the Phoenix, but they are to be without several players. Wellington captain Andrew Durante, Ben Sigmund and Manny Muscat are all suspended after picking up eight yellow cards for the season. Furthermore Vinnie Lia has been ruled out with a hamstring injury sustained on Saturday, giving Ricki Herbert a selection issue leading into the Wednesday night clash. Herbert has called in two local Kiwi players to fill the void, Sean Lovemore from Waitakere United and Aaron Clapham of Canterbury United. Lovemore, a striker, and Clapham, an All-Whites squad player, will join the team on Tuesday morning. “To get the support of the clubs and New Zealand Football at such short notice was fantastic” Herbert said. Forgetting a woeful 2010, Sydney FC are unbeaten in six games this year, and will be aiming to use their final two regular season matches as a confidence build for the Asian Champions League. Phoenix have not been able to maintain form throughout the entire season, making for an interesting mid-week match-up. For your chance to witness the personal message from the new Sydney signing, make sure you head along to the game. Kick-off is at 7pm, and tickets are available here, or at the gate.